The Timberwolves meet the Nuggets tonight in Denver (9:30 p.m.) in a game with obvious playoff implications — the Wolves (44-34) are tied for seventh in the Western Conference and Denver (43-45) is ninth. The first tiebreaker for two teams is head-to-head record. 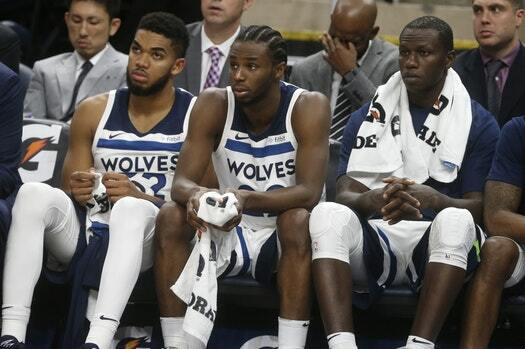 The Wolves are 4-0 vs. L.A. Clippers and New Orleans; 3-1 vs. Oklahoma City; 2-2 vs. Utah; 2-0 vs. Denver with two games remaining; and 1-2 vs. San Antonio. Timberwolves remaining games: at L.A. Lakers on Friday, home vs. Memphis on Monday, home vs. Denver on Wednesday. The Clippers are at Utah tonight in another big Western matchup. East: 1-Toronto vs. 8-Milwaukee, 2-Boston vs. 7-Washington, 3-Cleveland vs. 6-Miami, 4-Philadelphia vs. 5-Indiana. West: 1-Houston vs. 8-New Orleans, 2-Golden State vs. 7-Minnesota, 3-Portland vs. 6-Oklahoma City, 4-Utah vs. 5-San Antonio. The AP also reported a seven-way tie for fourth in the West is still possible, with everyone at 46-36. If that were to happen, one team with that record would get home-court advantage and two teams with that record would miss the playoffs entirely.